The Hopi are home, the keepers of sacred place on Earth. Even though their land is very small, in their migrations they blessed all the lands of the Americas. They are the center of all our motion. The Maya are time, the calendar keepers, the day keepers. They are the ones who tell us when the time has come. For us Maya, the Pahana is Kukulcan – two different names that represent the same symbol. The prophecies say that when the sacred symbols are newly understood, it will be the time of awakening for the human race before our father, the Sun, and his sisters, the stars. In his own book, Secrets of Mayan Science and Religion, Men expands on the meaning of the Pahana/Kukulcan archetype. He explains that “Ku” means sacred, God. “Kul” is coccyx, the base of the spine where a mysterious solar charge resides. “Can” means serpent. “Kukulcan” therefore, is the serpent of sacred knowledge -- virtually one and the same as kundalini, fiery serpent energy of Eastern yoga traditions. This same serpent energy is known in esoteric yoga traditions throughout Mesoamerica and is commonly referred to by its Aztec name Quetzalcoatl, or Feathered Serpent. Sacred knowledge associated with Feathered Serpent is embedded in ancient pyramids throughout Mesoamerica. Thousands of people visit these structures each year but only a handful realize something very essential about them. It is a message conveyed on the lips of contemporary practitioners of Mayan spirituality when they say: ”You are the pyramid, the pyramid is you.” What these practitioners are refering to is that the cosmic principles coded into sacred pyramid architecture are one and the same as those coded into the human body. Nowhere is revelation of this sacred knowledge more apparent than in a spectacular equinox phenomenon associated with the Pyramid of the Feathered Serpent at Chichen Itza in the Yucatan. Each year, at both the spring and the fall equinox, tens of thousands of people from around the world gather in Chichen’s temple courtyard to witness a spectacular phenomenon skillfully contrived by ancient temple builders to reveal the secrets of Mesoamerican cosmology. Exactly on the day of the equinox a distinct pattern of light and shadow forms on the western side of the northern stairway of the temple: a giant undulating serpent, made up of seven triangles of light, descends from the top platform of the pyramid to a huge sculpted serpent head at its base. The Mayan masters teach that we are the integration of the seven powers of light, traveling in the form of the serpent, undulating eternally with movement and measure. In Mayan, the pyramid is called k’u, the root word for the sacred Hunab K’u, the Only Giver of Movement and Measure. 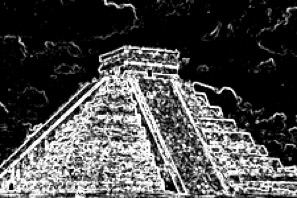 Thus, when we see the seven triangles in Chichen Itza during the equinoxes, we are witnessing a demonstration of culture which pervades the atmosphere and stones of this sacred place. With respect and humility, we should kneel before the presence of Kukulcan or Quetzalcoatl. By so doing, we will begin to awaken our cosmic consciousness, allowing Hunab K’u to enter the sacred temples in our bodies! As spiritually empowering as it can be to witness first hand, this magnificent revelation of sacred cosmological knowledge, it is simply not practical for everyone attracted to Mesoamerican spirituality to journey there for initiation into its mysteries. I believe the ancient Maya anticipated this when they coded much of their cosmic knowledge into the hieroglyphic language of the sacred Tzolkin calendar still in use to this day in the highlands of Guatemala. This is essentially the same body of sacred knowledge first introduced to me by Jose Arguelles and through his writings I was able to embrace the universality of the Tzolkin early on. This eventually led to my formulation of a novel path of attunement to the sacred calendar I have come to call The Lightning Path.